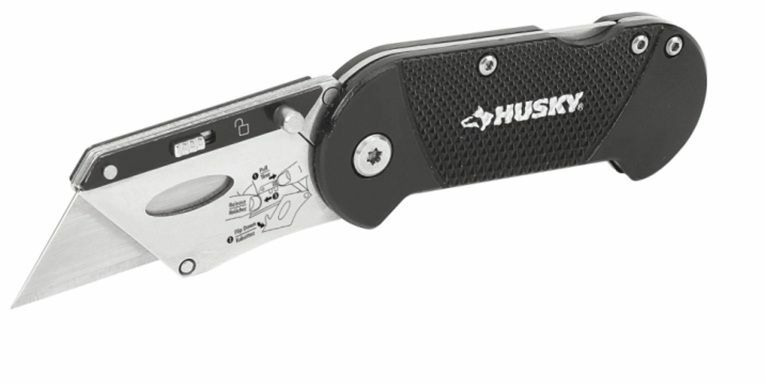 The Husky Compact Folding Lock-Back Utility Knife features a compact design and a quick-change blade mechanism that accepts standard size utility blades. The lock-back design locks the blade in place for safe and efficient cutting while the compact size, convenient folding design and lightweight aluminum handle with clip makes it easy for a user to safely store the knife in their pocket. This knife is great for use at home, on the job or outdoors. 2.4-inch Compact Folding Lock-Back Utility Knife The Husky Compact Folding Lock-Back Utility Knife features a compact design and a quick-change blade mechanism that accepts standard size utility blades. The lock-back design locks the blade in place for safe and efficient cutting while the compact size, convenient folding design and lightweight aluminum handle with clip makes it easy for a user to safely store the knife in their pocket. This knife is great for use at home, on the job or outdoors. 2.4-inch Compact Folding Lock-Back Utility Knife is rated 4.3 out of 5 by 24. Rated 5 out of 5 by JustSaying from Bought some on sale to try out and finally found my perfect knife fits perfectly in my hand and t... Bought some on sale to try out and finally found my perfect knife fits perfectly in my hand and the blade stays put in the holder; the only bad thing I can say about them is that the original knives were in a 3 pack for $6 and now they are $5 each. Went out and bought 6 more in case they quit making them. Rated 4 out of 5 by Tyson from Love this knife! I use to buy a 3 pack it came in with 2 larger ones each year, just to give away... Love this knife! I use to buy a 3 pack it came in with 2 larger ones each year, just to give away the larger ones and get the small one because I love it so much! So glad I finally found this knife on its own so I can stop buying the large ones with it! Nervous to try new ones if riveted... but may be better? Here's for hoping. Only issue is after about a year the clip always falls off.